LOS ANGELES (AP) - A wildfire erupted in Los Angeles' exclusive Bel-Air section Wednesday as yet another part of Southern California found itself under siege from an outbreak of wind-whipped blazes that have consumed multimillion-dollar houses and tract homes alike. Hundreds of homes across the L.A. metropolitan area and beyond were feared destroyed since Monday, but firefighters were only slowly managing to make their way into some of the hard-hit areas for an accurate count. As many as five fires have closed highways, schools and museums, shut down production of TV series and cast a hazardous haze over the region. About 200,000 people were under evacuation orders. No deaths and only a few injuries were reported. From the beachside city of Ventura, where rows of homes were leveled, to the rugged foothills north of Los Angeles, where stable owners had to evacuate horses in trailers, to Bel-Air, where the rich and famous have sweeping views of L.A. below, fierce Santa Ana winds sweeping in from the desert fanned the flames and fears. "God willing, this will slow down so the firefighters can do their job," said Maurice Kaboud, who ignored an evacuation order and stood in his backyard with a garden hose at the ready. Air tankers that were grounded most of Tuesday because of high winds went up on Wednesday, dropping flame retardant. Firefighters rushed to attack the fires before the winds picked up again. They were expected to gust as high as 80 mph (about 130 kph) overnight into Thursday, possibly creating unprecedented fire danger. The California Department of Forestry and Fire Protection uses a color-coded wind index in its forecasts. Tomorrow's forecast is purple, the most extreme conditions, which has never been used before, director Ken Pimlott said. "Conditions are going to change again tonight," Pimlott said. "They're going to be extreme tomorrow. We need to have everybody's heads up - heads on a swivel - and pay very close attention." Before dawn Wednesday, flames exploded on the steep slopes of Sepulveda Pass, closing a section of heavily traveled Interstate 405 and destroying four homes in Bel-Air, where houses range from $2 million to more than $30 million. 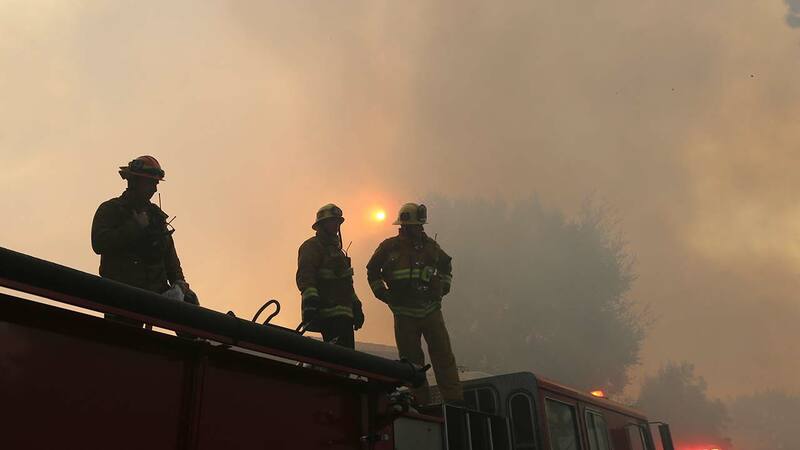 Firefighters hosed down a burning Tudor-style house as helicopters dropped water on hillsides to protect homes from the 150-acre (60-hectare) blaze. A Christmas tree saved from the flames was in the front yard of a burned-out house and a large painting was propped against a Range Rover. Bel-Air was the site of a catastrophic fire in 1961 that burned nearly 500 homes. Burt Lancaster and Zsa Zsa Gabor were among the celebrities who lost their houses. Across the wide freeway from the fire, the Getty Center art complex was closed to protect its collection from smoke damage. Many schools across Los Angeles canceled classes because of poor air quality. UCLA, at the edge of the Bel-Air evacuation zone, canceled afternoon classes and its evening basketball game. By late afternoon, firefighters said they had controlled the fire's advance. Production of HBO's "Westworld" and the CBS show "S.W.A.T." was suspended because of the danger to cast and crew from two nearby fires. In Ventura County northwest of L.A., the biggest and most destructive of the wildfires grew to 101 square miles (262 square kilometers) and had nearly reached the Pacific on Tuesday night after starting 30 miles (about 45 kilometers) inland a day earlier. The fire destroyed at least 150 structures, but incident commander Todd Derum said he suspects hundreds of homes have been lost. While winds were calmer Wednesday, the fire remained active around Ventura, spreading along the coast to the west and up into the mountains around the community of Ojai and into the agricultural area of Santa Paula. "We're basically in an urban firefight in Ventura, where if you can keep that house from burning, you might be able to slow the fire down," said Tim Chavez, a fire behavior specialist at the blaze. "But that's about it." For complete coverage of the California wildfires, click here.